As soon as I walked through the doors I noticed a young woman sitting quietly at her desk, she worked for the Firm I had an appointment with on this day. ‘Good morning’ she said smiling cheerfully as I walked past her desk, her eyes looked happy, ‘good morning to you’, I replied with a smile, ‘could you tell me how to get to the elevators please’ I asked the woman, ‘down the corridor and to the right’, she stood up as she was explaining pointing her fingers on her right hand in the direction she wanted me to go. ‘Thank you’, I said gratefully, I never did have a good sense of direction, I wonder how she knew that about me, I thought to myself? I wasn’t more than a few steps from her desk on my way to find the elevators when I heard a loud voice bellowing behind me, as I instinctively turned around I noticed quite a few other people had done the same, all turning their heads to see who was making all the fuss. The young woman sitting at her desk had lost her smile and her eyes had begun to water, tears were ready to fall it was just a matter of time. There was a short and stalky balding man standing in front of her I could feel his anger through his body language he was stiff and rigid almost as if he was preparing to go into battle. He was yelling in a loud voice at the woman sitting at her desk, something to do with a clients file and a missing invoice. I had stopped in my tracks so I had a full view of the chaos in front of me. I noticed the woman had begun to acquire her pose and once again her smile had returned to her face, how could she manage to turn her energy around so quickly especially when she seemed to be the centre of attention for so many people watching I wondered? Then I saw her reach down into her desk drawer and pull out a single piece of paper, she handed it to the man and quietly said, ‘here you are, you left this on my desk this morning by mistake, I kept it safe for you’! The short and stalky man grabbed it out of her hand and walked off. I couldn’t help myself I walked back over to the woman’s desk, ‘you handled that beautifully’ I said to her full of pride as if she were a close friend, ‘thank you’ she replied, ‘he really is a nice man but I know he is very stressed at the moment so I didn’t take his anger towards me personally’ she went on to say, ‘it’s his stuff, not mine’ she said to me as she winked with a little chuckle. It’s not what people negatively say to you that has to belong to you, it is the other person’s internal stuff, what is important is to notice how you emotionally react to the comment or behaviour because it’s a clue to where you still need to heal inside. 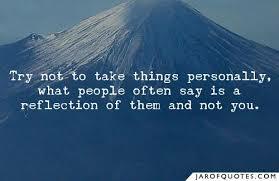 It isn’t necessary to take things other people say personally, what is most important is you recognize how you feel when someone says or does something that might hurt you, because what you are feeling is something old that needs your loving attention, so eventually you can let it go. When you release an old wounding there no longer will be an emotional reaction, and this my dear Soul is a beautiful thing and a very peaceful way to live.